John Lockyer has been volunteering for Weldmar Hospicecare for over six years – helping the Fundraising Team with a wide range of activities, and is a valued member of the team. John’s wife, Shirley, received care from Weldmar throughout her illness – from both the inpatient team at Joseph Weld Hospice and the Weldmar Community Nurses at home. John said “The whole Weldmar clinical team were fantastic. It was very important to me, to know that there was a group of professionals who could help me during what was a very difficult time. These coffee mornings, hosted at Joseph Weld Hospice, meant that John was introduced to the work of the Weldmar Fundraising Team – who approached him to ask for help. “One of the team asked me if I could help by visiting shops in Shaftesbury, to collect the full collection tins, as she had heard that I knew the area. I wasn’t sure at first, but said I would give it a go. It actually helped me a lot, as I got to meet so many new people – and my involvement with fundraising just snowballed from there”. John now collects the collection tins from Shaftesbury, Blandford, Lyme Regis and Abbotsbury – revisiting all the shops and other premises that have one of Weldmar’s tins every 13 weeks. “I worked out that I travel roughly 1,000 miles a year in my car collecting the tins for Weldmar,” said John. 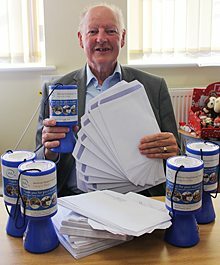 He has also taken on the role of delivering all the biannual newsletters and other Fundraising leaflets across Dorchester by hand – helped by a team of eight other people that he organises. That’s around 1,500 households every time! Grant Usmar, Director of Fundraising, said “John does so much for Weldmar, and gives freely of a great deal of his time. Not only collecting our tins, and delivering our newsletters – but we always know that we can rely on him to be in charge of our car park or taking the money on the gate at many of our events. I know that the whole team would like to express their gratitude to John – who always seems to say ‘Yes’ to whatever is asked of him. “Come and give it a go! I love volunteering for Weldmar. It gives me something to look forward to every year, it keeps my mind occupied and gives me the opportunity to meet so many different types of people from all walks of life”.